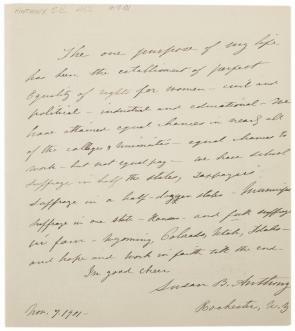 Writing at the age of eighty, having just retired from a long public life as an advocate for abolition and women’s rights, Susan B. Anthony trenchantly summarized the gains that had been made in women’s rights. Her energetic tone suggests the inner resilience that had established her as a leader in the drive for women’s voting rights and would propel the movement far into the twentieth century. The one purpose of my life has been the establishment of perfect equality of rights for women – civil and political – industrial and educational. We have attained equal chances in nearly all of the colleges and universities – equal chances to work – but not equal pay. We have school suffrage in half the states, taxpayers’ suffrage in a half-dozen states – Municipal suffrage in one state – Kansas – and full suffrage in four – Wyoming, Colorado, Utah, Idaho – and hope and work in faith till the end. Nov. 7. 1901 – Rochester, N.Y.
Read the document introduction and transcript and apply your knowledge of American history in order to answer the questions that follow. On an imaginary report card for 1901, rate the success of each of Anthony’s concerns—civil, political, industrial, and educational. Base your answer on solid evidence. If we could talk with Susan B. Anthony today, how satisfied would she be with her stated objective of acquiring “perfect equality of rights for women”? In 1901, many men and even women considered Anthony and her followers aggressive, unreasonable, and demanding. Why did they hold these opinions?